Although the actual times vary throughout the year, wombats generally spend about two-thirds of their lives in their burrows. What do they do there? Until glass-roofed or glass-sided burrows can be devised, and wombats persuaded not only to use them but also to behave naturally in them, what happens in the darkness of those narrow tunnels will probably remain something of a mystery. In studies of the behaviour of wombats in captivity in several zoos in Europe, Arnfrid Wunschmann made many observations of wombats dozing and sleeping. Using his descriptions, as well as my own observations of hand-reared wombats, some of which frequently returned to the house for periods of sleep, many years after being released into the wild, I think it reasonable to assume that similar behaviour occurs in the burrow and that a wombat's day is spent in a manner something like what is described below. At the Perth Zoo, part of the wombat enclosure includes an underground tunnel system with a viewing area for the public. 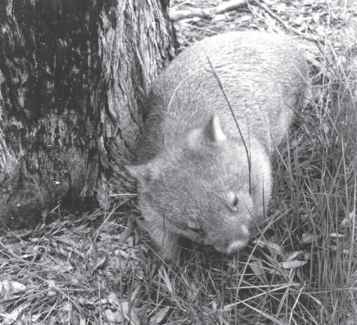 Observations on the southern hairy-nosed wombats there confirm most of these assumptions. 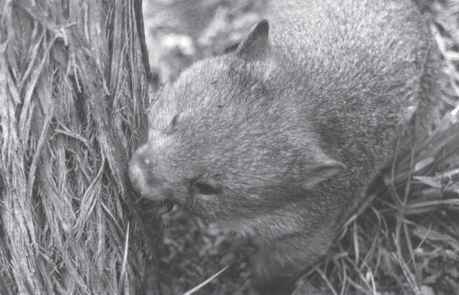 Figure 4.1 Before entering the burrow, a wombat often uses a tree as a rubbing post.